Located in the former Italian section of Barre, the Socialist Labor Party Hall is a two story flat-roofed brick structure with a gambrel-roofed single story rear hall. It is associated with Barre's rich ethnic heritage, specifically the vital Italian community that immigrated to Barre at the end of the 19th century. The building was constructed in 1900 by volunteers of the Italian community as a meeting hall for the Socialist Labor Party, a political group dedicated to social and labor reform. Its design reflects no particular architectural style, but its form does illustrate the building's function as an assembly hall. The exterior is simply ornamented with Barre granite details. The most important of these is a carved medallion depicting an arm bearing a hammer, the symbol of the Socialist Labor Party, and the initials SLP. The direct association of this property with the labor movement, community, and the immigration of Italians makes it one of Barre's most important buildings. The Hall provided the community with a place to meet, organize, and socialize. Dances, boxing and wrestling matches were held here. In 1901, the Co-Operative store was started in the basement to provide necessities for the community. When the Hall opened in 1900, more than 90 percent of Barre's workers belonged to one of 15 local unions, many of them probably attended union meetings and political rallies held here. From 1900 to 1936 the building held the offices and meetings of the Granite Cutters International Association, at the time the largest local union of granite workers in the country. Labors leaders such as Eugene Debs and Samuel Gompers are known to have visited Barre and, although unconfirmed, likely spoke at the Hall. 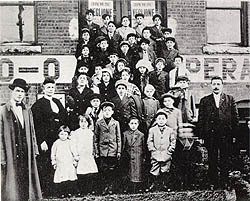 During textile strikes taking place in Lawrence, Massachusetts, the Italian community in Barre sheltered 35 children of those striking workers, all of whom were received at the Hall. During one political gathering, illustrating the sometimes volatile nature of political groups at this time, an argument broke out between socialists and anarchists, ending in the fatal shooting of Elia Corti, a prominent Italian stone carver responsible for the panels on the Robert Burns Memorial statue in Barre. In 1936, the Hall was sold and converted to a warehouse for The Washington Fruit Company and later the Vermont Pak Tomato company. In 1995 the Hall was purchased by the Barre Historical Society, with much support, to restore it as a library, community meeting hall, and social club. The Socialist Labor Party Hall is located at 46 Granite St. It underwent restoration in 1994 and now serves as headquarters for the Barre Historical Society and as a venue for events. Visitors can call 802-479-5600 for hours and information, and the Society maintains a website at http://www.oldlaborhall.com/.